Everyone is constantly on the lookout for healthy alternatives to their favourite foods. Amongst these alternatives, the reigning champion and granddaddy of them all is the veggie burger. Promising you all the flavor and grandeur of the hamburger but in a much healthier package, it has become a staple on restaurant and fast food menu’s and was a popular choice for us in our article Canada’s Healthiest Fast Food Options. 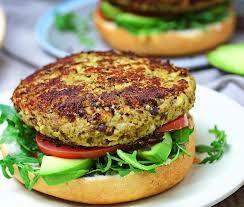 So with its prevalence and popularity, let’s get the scoop on the vaunted veggie burger. First off, in a lot of cases we need to move beyond the term veggie, as the traditional veggie burger has ostensibly ben replaced by the meatless burger, with patties varying from straight veggie, to tofu to bean or grain. The meatless patty offers restaurant patrons and home consumers a summer staple that fits into a plant based diet, can appease vegan eaters and vegetarians alike. Let’s face it, the option to have a healthy burger available on a hot summer day with the barbecue fired up is an amazing alternative and one of the reason for its rise to prominence. So, from a nutritional standpoint what are some things we should be looking at? Number one is protein, and that’s something that soy burgers have in spades, often delivering between 15 and 25 grams of protein for one patty, while the average beef burger will be offer 23 grams. As anyone looking to add muscle knows, every gram of protein is important and the more you can squeeze into a meal the better. Protein hunters be warned though that not all meatless burgers are created equal as those patties comprised mainly of grains, veggies, millet and quinoa can contain as little as 3 or 4 grams. So make sure to check before you choose and aim for a burger with at least 12 grams of protein, or plan on supplementing with some extra protein. Saturated fats, or lack thereof, is a high selling point of veggie burgers, as the majority are only brining about 2 grams of saturated fats to the table versus an average of 3.5 in a basic hamburger, with the majority of that fat coming from heart-healthy polyunsaturated oils like canola or sunflower. Calorie wise, the average meatless burger is packing between 100 and 150 calories, versus the 295 calories found in the average 100 gram hamburger. Another impressive win for the veggie or meatless burger. But to add the caveat again, not all meatless burgers are created equal and you need to take the time to look closely at the nutritional information for each individual burger. Again, it’s all about paying attention to everything and not just trusting the promises on the front of a box or the littler “healthy” icon on the menu. Others would point out another major downfall of a lot of meatless burgers, which also holds true with many packaged products, is the presence of potentially harmful chemicals. These chemicals are added to keep the product fresh, to make it appear more delicious, or simply because it makes the mass production of the burger more inexpensive. Regardless of why these potentially harmful chemicals and GMO products may have been used, it is just a good idea to be aware of whether or not they are in something that you are putting into your body. So, when it comes to veggie and meatless burgers the real lesson is that no two are created the same, and each burger must be approached as its own entity. Approaching each one as though it will definitely be healthy is like approaching a test without studying, so do your due diligence if you want to get the most out of your veggie burger experience.